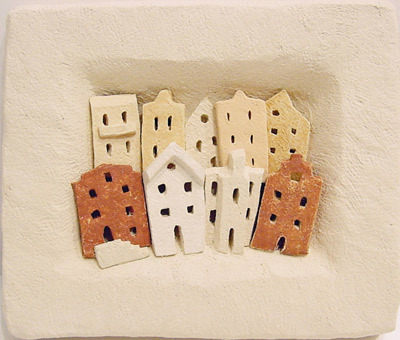 Village 67, ceramic, 6" x 7"
Elizabeth Shriver is a native Iowan and a 1987 graduate of the University of Iowa. Her interest in ceramics dates back to her first studio ceramics course in 1985. In recent years she has worked in her own home studio, and exhibited her work in the Eastern Iowa region. She says this about her work: "I work with clay to create an array of graceful, organic forms. These pieces are made through a variety of hand-building methods such as slab-building, coiling, pinching, and forming with molds. Rarely relying on glaze, I use textures, stains and colored clay to add visual and tactile interest. I am drawn toward neutral earth tones, and my work reflects the natural landscape, plant and undersea life that are my inspiration." "The curving lines of nature inherent in my work generate an illusion of movement, giving each piece an almost lifelike quality. A successful piece is one that begs to be touched as well as explored visually."